Today, when you order "Pockets Full of Miracles by Diamond Jim Tyler - DVD", you'll instantly be emailed a Penguin Magic gift certificate. You can spend it on anything you like at Penguin, just like cash. Just complete your order as normal, and within seconds you'll get an email with your gift certificate. This DVD contains the original volumes 1&2, cramming in 23 of the routines from Diamond Jim's "sold-out" book. The performance shots were filmed impromptu in a restaurant and at the Magic Castle in Hollywood, CA. 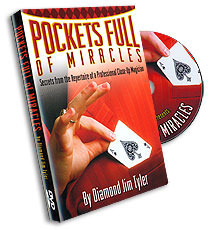 This DVD will teach you some of Diamond Jim's best work, audience tested, mind blowing effects! This is a great little DVD full of little fun stuff. There are a lot of little fun, amusing, and pretty good magic items. There are some pretty good effects in here and even though I have literally hundreds of magic DVDs, I learned new illusions and new handlings. 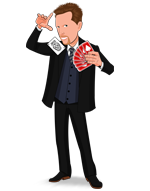 I particularly like that a lot of what I learned can be added to other tricks (For example and effect with an animated card box that can be used at the end of any card trick), as well as some pretty good tricks like the one handed ace production. There are also little items that can be done with items someone might have lying around their home or just about anywhere. Nice DVD and well worth the price.